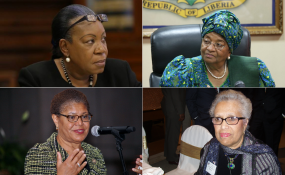 From top, left to right, Catherine Samba-Panza, Ellen Johnson Sirleaf, Karen Bass and Constance Newman. In the run-up to the July 30 elections, President Emmerson Mnangagwa was saying all the things Zimbabweans wanted to hear. He particularly promised in colourful outdoor billboards and media advertisements that if he won the elections, this country's citizens would enjoy unfettered freedom of expression and assembly they longed for during his mentor Robert Mugabe's reign. Mnangagwa had swept into power in November last year following a military coup that ended Mugabe's 38-year-long dictatorial rule. He wanted to use the elections to enhance his legitimacy. The "voice of the people is the voice of God" became the Zanu PF leader's war cry as he backed popular protests that eventually forced the 94-year-old politician to quit. Mnangagwa was promising a new Zimbabwe provided he was given the mandate to rule the country in what his supporters call a second republic. He got his wish to be the country's second leader after Mugabe when the Constitutional Court endorsed his controversial victory in August, but is yet to demonstrate that he intends to stick to his promises. Events of last week where over 100 Zimbabwe Congress of Trade Unions (ZCTU) leaders were arrested ahead of planned protests over the 2 cents electronic money transfer tax raised serious doubts about Mnangagwa's commitment to democracy. Besides the clear assault on the unionists' freedom of assembly, the arrests were carried out in scenes that reminded many of the Mugabe era. Some of the ZCTU leaders were dragged from their offices in Harare and bundled into police trucks. Others were heavily assaulted with truncheons as they were dragged to Harare Central Police Station. The unionists will spent two nights in custody awaiting bail after the Prosecutor-General's office initially refused to have them prosecuted on the basis that the police did not have enough evidence against them. The late Morgan Tsvangirai, who was feted by Mnangagwa as a true champion of democracy, suffered the same indignity under Mugabe as the ZCTU leaders. Mnangagwa at one time promised to preserve Tsvangirai's legacy in his new Zimbabwe, but the events of last Thursday and Friday must have left the former prime minister turning in his grave. According to the Southern African Trade Union Coordination Council (SATUCC), the action taken by the Zimbabwe Republic Police was "a gross violation of fundamental workers' rights to organise, assemble and expression". We can't agree more with SATUCC's position. Such actions will only serve to erode the credibility of the so-called new dispensation. Mnangagwa, if he is a true democrat, must ensure that trade unions are given the freedom to organise and defend workers' rights as envisaged in the constitution.